Alex has been been a regular player throughout the Rocky Mountain Gig circuit. He's been an integral member of a long list of eclectic groups even before he could drive himself to gigs. Playing everything from straight-ahead Jazz, Bop, Funk, R&B, Soul, Rock, Hip-Hop, Big-Band Swing, Acoustic Bluegrass, and even a little country, its easy to see why Alex is considered one of the most talented & versatile Musicians around. Raised in Wyoming's Big Horn Basin, Alex began studing guitar with legendary guitarist Jeff Troxel at a very early age. After graduating from Riverside High School in Basin, he attended Northwest College in Powell, WY where he continued studying guitar. A three-year stint in the University of Northern Colorado Jazz Studies program yielded Alex his first Bachelor's degree. During his stay in Colorado, he won numerous soloist awards at the UNC/Greeley Jazz Festival and was awarded the Walt Francis Jazz Award for outstanding graduating senior. In 2014 Alex joined the staff of Rocky Mountain College as professor of guitar and currently teaches guitar, bass, and banjo at Allied Music in Billings, MT as well as maintaining an active performance schedule throughout the West. Percussionist Matt Devitt has been an active musician and instructor in the Northwest area for more than 20 years. He is a founding member of END ever, Outpost Tuney Hall of Fame winner for the Hard Rock category. He also is a member of John Roberts Y Pan Blanco and The Parker Brown Band. Devitt has performed, as a freelance musician, with the Billings Symphony Orchestra for over 15 years. He has played with several big bands and is well known in the musical community of Montana. Devitt was a featured clinician at the Montana Day of Percussion in 2007 and 2015. He has been teaching drums at Hansen Music for 18 years and has been an applied percussion instructor at Montana State University Billings since 2005 and Northwest College since 2014. Devitt has a BA in Music Performance from MSU-Billings. Specializing in double bass, electric bass and guitar, Parker Brown is a private instructor, songwriter, freelance and studio musician. With a full private studio at Allied Music in Billings, MT, Parker is also an adjunct faculty at Sheridan College in Sheridan, WY and Rocky Mountain College in Billings, MT with skill levels ranging from beginner to advanced. He is featured on over twenty albums for artists all over the country as a bassist and guitarist, working primarily with Base Camp Studio in Bozeman, MT. Montana native Tony Hammond currently teaches middle school choir and general music at Medicine Crow Middle School in Billings, MT. He is also an Adjunct Professor of Music at Rocky Mountain College where he teaches instrumental methods and low brass. As an active vocalist and trombone player, he performs frequently in styles ranging from funk and rock to jazz and classical. He maintains a busy schedule as a clinician, adjudicator, and guest conductor in both vocal and instrumental music locally and regionally. As an AMP Camp contributor, Tony will focus on vocal performance with bands, emphasizing vocal health, styles, and stage presence. A frequent performer with small groups at past AMP Camps, he hopes his tutelage will encourage even more young singers to take the lead. A native of Powell, Wyoming, Erik Olson has proven an exciting new addition to the Billings, MT music scene. His talents as a pianist, woodwind specialist, composer, and educator have kept him busy performing in the northwest region. Having two musicians as parents, Erik took to music at a young age. He began taking piano lessons at 5 and was performing for crowds by the time he was 8. Upon entering high school, Erik quickly gained recognition as one of the best young musicians in the state and was already playing regularly with some of the most prominent performers in the rocky mountain region. During his secondary education at Northwest College in Powell, Wyoming, and at University of Wyomin’, Erik won awards at numerous classical and jazz competitions around the country. 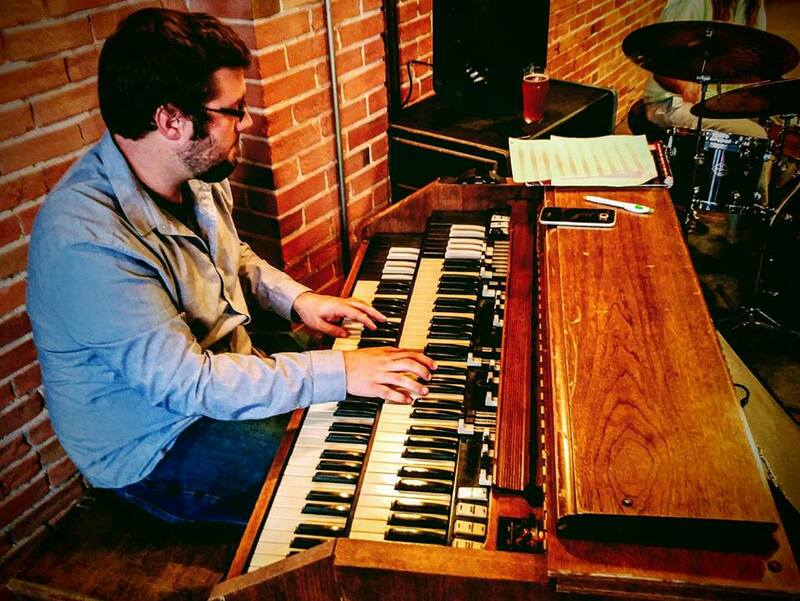 Currently Erik plays in a number of well known Montana groups, namely Parker Brown and the Bleeding Hearts, Alex Nauman Organ Trio, Kyle Shobe and the Walk ’em Boys, The Walkers Trio, and The Big Sky Trio. He has also performed and recorded with various Country, Classical, Funk, Rock, R&B, Hip Hop, and Soul groups around the area. At only 28 years old, Erik has performed with jazz legends Stefon Harris, Steve Turre, and the Glenn Miller Orchestra. Other notable artists that he has performed with include Nick Mancini, Ronnie Bedford, Kansas, Dave Pietro, and Eric Reed. In 2013, Erik accepted a position at Sheridan College as a Piano and Saxophone instructor. Erik also is one of the founders of Allied Music, which is a well known performing arts academy located in Billings, MT. For the past 5 years, Erik has played and taught in and around the Billings area where he continues to expand Montana’s music scene through his playing and teaching.